Having the leading ride-hailing brand in the world gives Uber a good chance of creating the premier global transportation platform. Revenue has historically grown quickly, but has decelerated markedly in the Ridesharing segment. Operating profitability does not look attainable in the short to medium term. Much higher revenues, or significantly tighter cost control, will be needed for it to become profitable. Our biggest concern is that autonomous cars would weaken its competitive position. 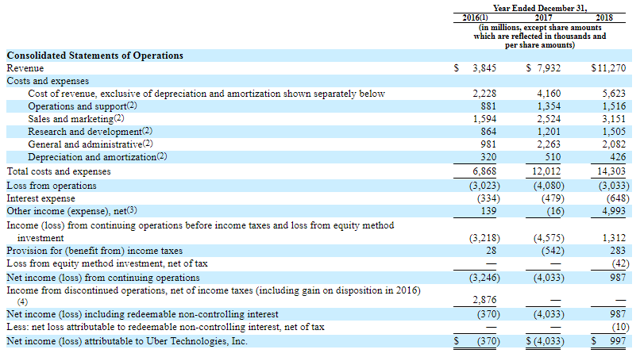 After reading Uber's (UBER) S-1 filing it becomes clear that they are aiming to become the Amazon (AMZN) of transportation. The word "platform" appeared 738 times in the filing. Another sign of this ambition can be found in their relatively new services like JUMP bikes, Uber Eats, and Uber Freight. When it comes to conquering the world, Uber seems to be doing a pretty good job. The map showing their global ridesharing footprint is quite impressive. In a significant number of countries it has a >65% ridesharing market share. The few important markets where it is not the dominant company, it has sold its operations in exchange for shares in the local leader. This is the case with Yandex Taxi in Russia, Didi (DIDI) in China, and Grab (GRAB) in Southeast Asia. This international strategy of either buying a competitor to gain the number one position, or exiting the market and selling the operations to the local leader, should help Uber reduce its cash burn. Still, trying to value Uber is complicated, to put it mildly. Looking at the positives, growth has been quite remarkable. As the Figure below shows, growth in annual gross bookings has been explosive, and they are constantly looking for new ways to expand the business. This growth has come at a significant cost, with Uber still reporting massive operating losses. The approximately $3 billion operating loss for 2018 is roughly 27% of their revenue. This is certainly an improvement compared to the previous year, where operating losses were close to 52% of revenue. While gross bookings have continued growing quickly, it is concerning that the ridesharing segment is showing signs of deceleration. The last few quarters most of the growth has come from Uber Eats. Moving our attention to their competitive position, we believe Uber only has a limited "moat" to defend itself against competition. The source of this moat comes from a variety of sources, including the value and recognition of its brand. There is also a small benefit from operating in many countries, mainly because some people appreciate being able to use the same app when they travel as in their local market. Having SoftBank (OTCPK:SFTBY) in their corner, as well as the billions they will likely raise in their IPO, are also important advantages, if used wisely. The amount of capital available can itself be a source of competitive advantage, giving Uber more flexibility to make large investments and outlast competitors. There is, however, a more crucial element in Uber's business model: drivers. 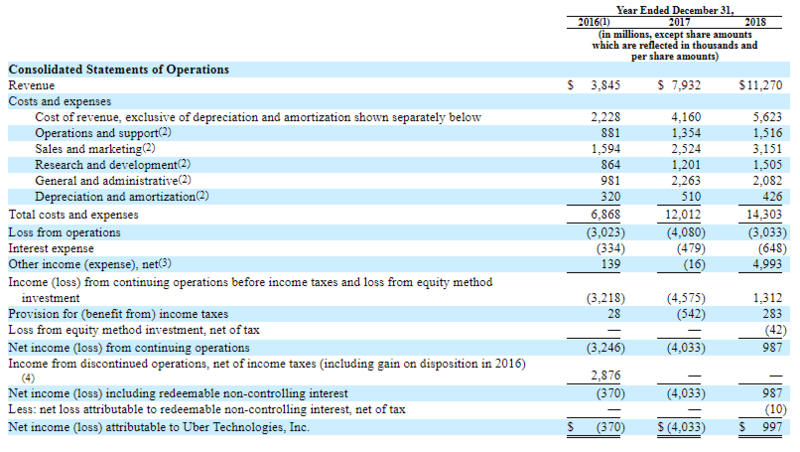 In our opinion the Figure below is the most important one in the entire filing, as it is central to Uber's business model. 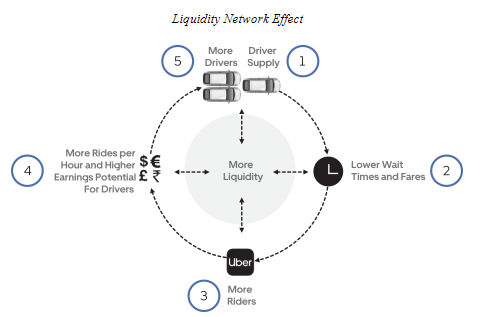 As can be seen, their liquidity network effect fly-wheel starts and ends with the drivers. Increasing the number of drivers in a market is necessary to lower wait times and fares, which increases the use of the app, improving driver earnings, which results in attracting more drivers. Drivers are a therefore the key piece in the business model. This makes losing drivers also their biggest vulnerability. It is strategic for Uber to gain driver's loyalty and make sure they are well taken care of. Otherwise drivers will be less likely to drive exclusively for them, making it easier for competitors to catch up. Longer-term, we see autonomous cars as the biggest threat to Uber. They risk turning the two-sided market place into a direct to consumer service. Building a two-sided market place is a lot more complicated, but has higher barriers to entry. A direct to consumer app can be launched quickly, provided one has enough resources. For example, should Google's (GOOGL) (NASDAQ:GOOG) Waymo reach a point where they are ready to deploy autonomous vehicles at scale, they could simply add a ride-hailing option to a new version of Google Maps. While Uber is the clear ridesharing global leader, and should be taken seriously, we see important vulnerabilities in their business model. Given these risks we don't believe there is a favourable risk/reward for investors at the reported ~$100 billion valuation it is expected to begin trading at in the stock market. The information contained herein is for informational purposes only. Nothing in this article should be taken as a solicitation to purchase or sell securities. Before buying or selling investments you should do your own research and reach your own conclusion, or consult a financial advisor. Investing includes risks, including loss of principal. Disclosure: I am/we are long SFTBY. I wrote this article myself, and it expresses my own opinions. I am not receiving compensation for it (other than from Seeking Alpha). I have no business relationship with any company whose stock is mentioned in this article.